In 1991 we proposed to NASA UNEX program a long duration balloon mission called FAR_XITE, which combined CZT detectors and multi-layer mirror shells. This would have been the first such instrument with hard X-ray mirrior technology. Unfortunately the instrument was not selected for development. 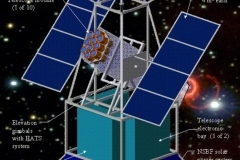 The proposed Fine Angular Rexolution X-ray Imaging TelescopE (FAR_XITE) mission is a high sensitivity, hard x-ray telescope carried on a long duration balloon gondola. It operates in the 20-90 keV band, making ~40 arcsecond (FWHM) resolution images over an 11 arcminute (FWHM) field-of-view and achieving a sensitivity of 0.3 mCrab at the center of the field-of-view for a (typical) 50 ks observation. 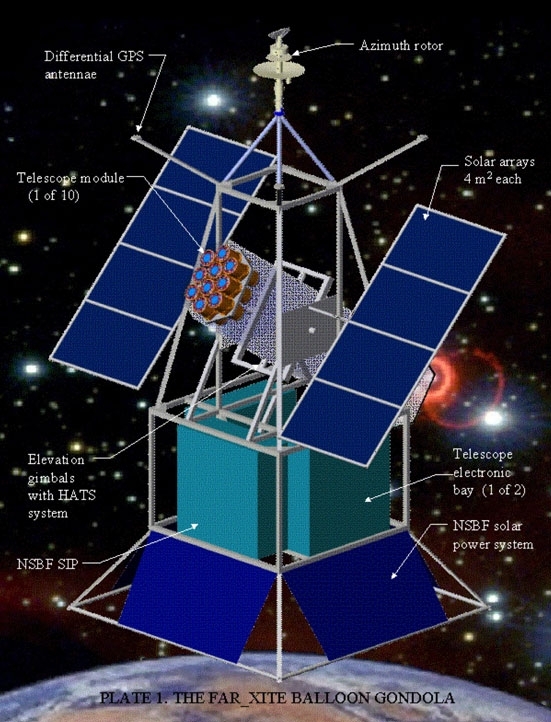 The science instrument is based on an array of nested Wolter type-I X-ray telescopes made with graded-d spacing multilayer mirrors to provide good throughput up to 90 keV. The focal plane detectors are CdZnTe (CZT) semiconductor devices, with crossed-strip readout. These detectors provide spatial resolution (500 microns) well-matched to the mirror point spread function (PSF), as well as room-temperature energy resolution only a few times broader than Germanium detectors. FAR XITE sm1We planned to make two flights from Alice Springs, Australia to South America. Because of the strict UNEX schedule, the first Alice Springs flight will be made with 8 (of 10 total) detectors and with a minimum of one third of the ultimate mirror complement. During each flight, about 500 ks of observing time will be accumulated, or 10 of the nominal 50 ks pointings used for sensitivity calculations. In practice, the observing plan would have incorporated both shorter and longer pointings tailored to the individual targets chosen. The total flight program provides a million seconds of observations of roughly twenty fields of view. Because FAR_XITE uses focusing optics, its background is proportional to the size of the PSF, rather than the area of the entire detector. It will therefore be the first hard X-ray instrument to operate in the source-dominated regime, where sensitivity improves in direct proportion to the observation time, rather than with the square root of time, as in the background-dominated case. This allows FAR_XITE to reach unprecedented sensitivities in a short observation, easily achieved on a balloon flight. FAR_XITE was a new direction in hard X-ray astronomy. 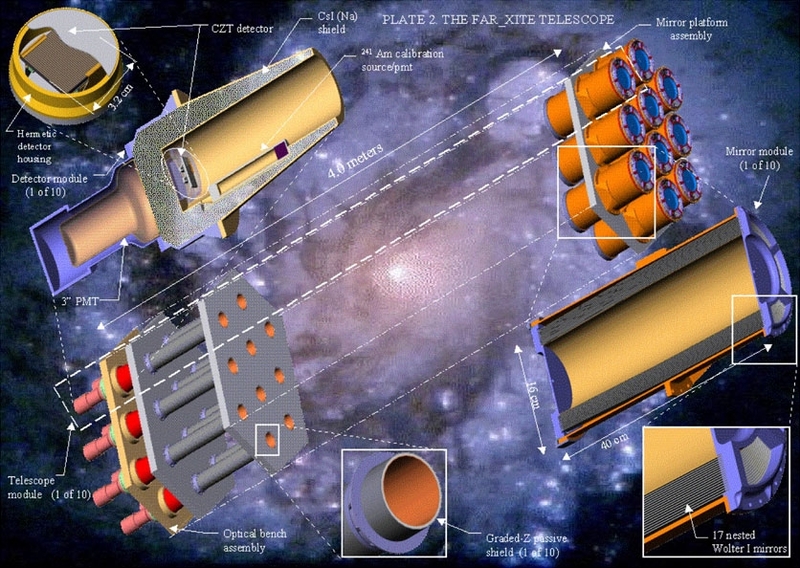 This makes FAR_XITE the hard x-ray analog of the EINSTEIN, ROSAT, and AXAF soft X-ray missions. FAR XITE sm2The FAR_XITE telescope consists of 10 coaligned Telescope Modules. Each TM contains a set of 17 nested Wolter~I x-ray mirrors and a CZT crossed-strip readout detector. A graded-Z passive collimator and a CsI(Na) active shield reduce and reject internal and diffuse external background radiation. In addition, an Am-241 radioactive source provides tagged 60 keV x-rays to allow continuous monitoring of the detector gains and in-flight or ground correction of any variations.